What was once a major medical issue for soldiers during World War I is still causing problems today for hikers, campers, festival-goers, construction workers, and security guards. Trench foot affects the feet after long exposures to cold, wet, and unsanitary conditions. While the best treatment is prevention, there are steps to take to treat the feet before gangrene sets in. 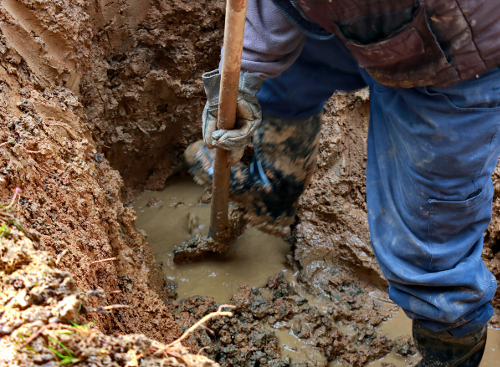 Let’s examine the signs to look for, treatments, and ways to prevent trench foot from occurring. Trench foot first became a common problem among troops as they stood in muddy trenches for long hours in water-soaked socks and boots. The trenches were not surprisingly unsanitary and often cold. Infection would eventually set in, and thousands of solders suffered from gangrene and subsequent amputations due to this condition. The widespread issue among armed forces resulted in modifications of the government-issued footwear, and soldiers were given a grease product to protect against moisture. What Are the Causes and Symptoms of Trench Foot? The conditions of warfare that produced trench foot more than 100 years ago may have changed, but the basic underlying factors still hold true today in certain situations. Back then, combatants had the improper footwear and living environment working against them during their time in the trenches. Today, civilian men and women in various job fields face risk factors. The following are factors that alone or together can be responsible for trench foot causes. Trench foot symptoms can be experienced in the toes, heels, or the entire foot. The condition has three distinct stages, each with its own signs and symptoms. In this early stage, the wet and cold environment constricts the blood vessels, producing symptoms of coldness to the touch, swelling, numbness, tenderness, and a slight change in color. At this stage, the foot can be restored to normal temperature with discomfort that only lasts up to a few days. Damage to the tissues begins to set in as improper circulation increases and the blood vessels expand. The foot begins to have increased swelling, tingling, and pain usually begins. If the foot is warmed at this stage, blisters appear, and once they burst, ulcers develop. This is when gangrene can set in. This stage can last from two to six weeks. This final stage occurs once the damage is done. The foot has increased sweating episodes, sensitivity to the cold temperature, itching, tingling, and pain. Over the following weeks and months, the foot begins to return to its normal appearance as the swelling decreases. In addition to the specific symptoms outlined in the three stages, there are other signs you may want to watch for with trench foot. This may include odor, bleeding under skin surface, burning sensation, and a sense of heaviness of the foot. During the time of healing, watch for any changes to the feet such as a dark or greenish hue as this indicates the tissue is dying. This and any worsening of symptoms needs medical attention. Amputation is a rare treatment. Trench foot was once the leading factor in foot amputations for many soldiers during the First World War. Today, we have the knowledge and means to prevent the condition from occurring to defense forces and the general public. However, there are environmental conditions and outdoor activities that can put your feet at an increased risk of prolonged exposure to cold, wet grounds. If trench foot does occur, there are precautions to take for treatment before it develops into serious infections like gangrene. Dutra, T., “Trench Foot – Symptoms, Treatment, and Prevention,” Foot Vitals; http://www.footvitals.com/injuries/trench-foot.html, last accessed May 16, 2017. Dr. Mary, “Trench Foot – Pictures, Symptoms, Causes, Treatment, Cure,” Bye Bye Doctor; http://byebyedoctor.com/trench-foot/, last accessed May 16, 2017. “How to Treat Trench Foot,” WikiHow; http://www.wikihow.com/Treat-Trench-Foot, last accessed May 16, 2017.